Wattles are flexible, cylindrical Sediment Retention Fiber Rolls (SRFRs) comprised of various types of compressed matrixes, designed to reduce hydraulic energy and filter sediment-laden stormwater runoff on slopes and in channels. They work in the same manner as silt fence, by ponding water and letting the sediment fall to the ground while the water slowly passes through the wattle. 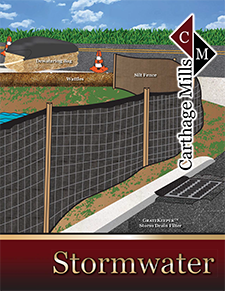 Straw wattles are an effective and economical alternative to silt fence and straw bales for sediment control and stormwater runoff. Wattles can be placed and staked along the perimeter of newly constructed or disturbed slopes. Their use to capture and retain sediment on the slopes is a best management practice (BMP). Fertile topsoil, organic matter, and native seeds are trapped behind Straw Wattles, and provide a stable medium for germination. Straw Wattles also retain moisture from rainfall, aiding the growth of tree seedlings planted to their up-slope side. Straw Wattles are available in various lengths and diameters to meet different project needs. They are installed by staking in place, and can be used individually or tied together to achieve any desired length.